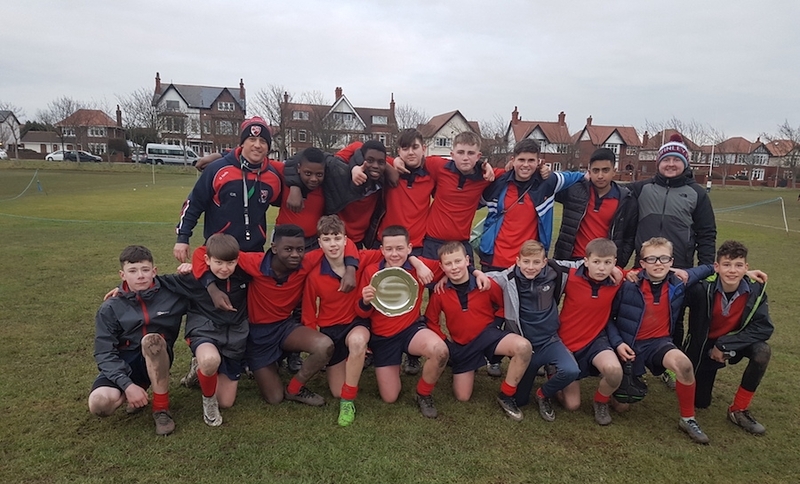 The Audenshaw School U13 Rugby team were crowned Lancashire Plate Champions yesterday after a thrilling display at the AKS Lytham festival. In the first encounter the men from Hazel Street defeated dual code specialists, Cowley High School from St Helens 15-10 with Damilola Akintola and Cole Beard amongst the stars. Game two saw Merchant Taylor's looking to avenge their defeat from earlier in the season but the reds were again too strong, winning the game 20-10. This performance was amongst the highlights of the day as Audenshaw's phase by phase play through Duke, Moran and O'Loughlin, coupled with the creative brilliance of Scanlon and the pace of Akintola and Nathan Clare ensured a second win in as many games Rivals, Manchester Grammar School were next in line and victory was ensured in the dying moments through the aptly named, Marvellous Ehiorobo who grabbed the decisive score. A thrilling final saw Audenshaw take a 15-5 lead with Ahmed Shamir and Nathan Clare outstanding only for St Mary's, Crosby to level with the controversial last play of the game. The winning of the Lancashire Plate, be it a shared one, is just reward for Mr Leach and his squad who have demonstrated a winning culture and sets them up ideally for the next stage in their rugby careers.